I am so excited about the arrival of spring greens! No, not the beautiful lettuces, spinach, watercress, and arugula that are showing up in markets right now (although those are much-welcomed) but the 2010 harvest of tea. I just received my order from In Pursuit of Tea, including their 2010 Mao Jian green, and it's wonderful. Before I was in the know about tea, I couldn't have even told you that tea has a season. But like any other agricultural product (tea is a plant! ), there is a time when the getting is good. For certain Chinese and Japanese greens, the time is now. 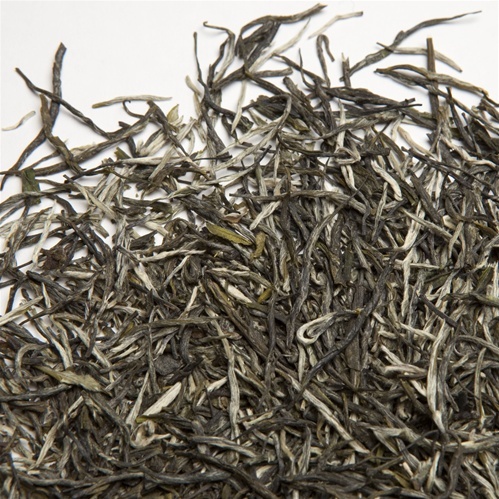 The Mao Jian has wiry leaves, twisted to form delicate strands of several shades of green. The aroma is bold, pure spring artichokes with a slight undercurrent of toasted nori. Yum!